What if all the best Tour stages happened in one race? 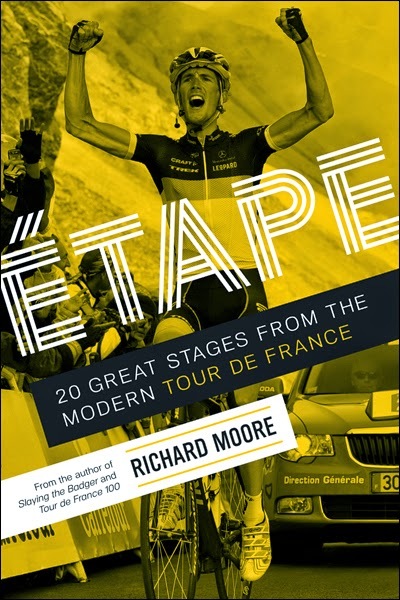 In Étape, critically acclaimed author Richard Moore weaves first-person interviews with cycling’s great riders to assemble a “dream team” of the best Tour de France stages in modern history. Featuring exclusive interviews with the Tour’s legends and scoundrels about their best-ever day on the bike (and their most heartbreaking defeats), Moore unravels lingering mysteries and recounts strange tales from 20 great stages of the Tour: LeMond’s impossible return from near-death, Schleck’s primal scream atop the Galibier, Merckx’s self-described toughest Tour, Cav’s mind-bending victory in Aubenas, Hinault’s hellish battle with Fignon. Italians Chiappucci, Poli, and Pantani are also part of the “dream team”.